Structure: Author Last, First M. “Presentation Title.” Event Name. Location, City. Date Mon. Year. Lecture. *Note: The event title, city, and location are not always specified in the lecture, but the information can be found elsewhere (like event programs). 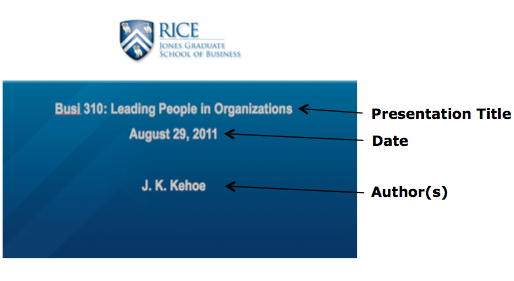 Citation: Kehoe, John K. “Busi 310: Leading People in Organizations.” BUSI 310 Class. Jones Graduate School of Business, Houston. 29 Aug. 2001. Lecture.